All Aboard! Exciting Potential Development Coming To Downtown Redding? Shasta Living Streets has been talking with the Shasta Historical Society and other stakeholders in the discussion about the historic Wells Fargo building on Yuba Street and the long underused Union Pacific railroad reservation on which it sits. 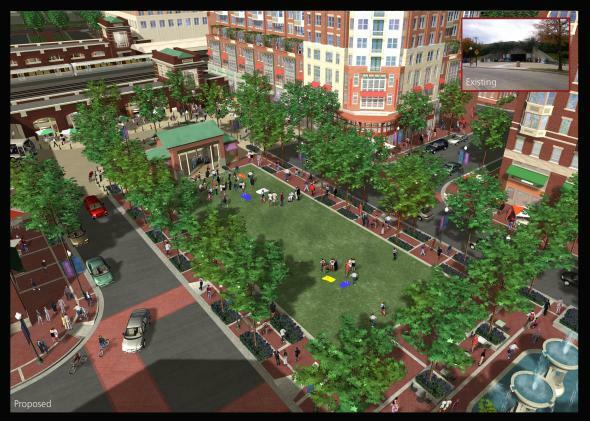 The current proposal would transform the site into “The Railyard,” a permanent home to the farmers’ market and a major multimodal transportation crossroads in downtown Redding! Adventure-cycling enthusiasts bringing their bicycles to town by Amtrak’s Bicycle Tourism Route. Read more about what Amtrak is doing to encourage and support tourists traveling with their bicycles. Take a look at the preliminary Master Plan, put together with input from many stakeholders by the talented team at Trilogy. Shasta Living Streets is working with the other stakeholders in this project to ensure that the infrastructure and facilities to support these groups (and their spending downtown) are included in the project scope. More ideas and details will come as we help develop the concept with stakeholders. For now, here are five key things that we think are necessary to make this project a success. Bikestation to provide services and information for people using a bicycle to get around Downtown Redding and beyond. Bike corral or bicycle lockers for shoppers at the Farmers Market and visiting the historical site and other attractions. If you have any ideas or other input you want to see included, or just want to talk about the project, please contact Anne. One of the facilities we are advocating for the Railyard project is a Bikestation that would serve people coming to Redding through the transit crossroads and as well as those using the Railyard for the farmers’ market and other activities. 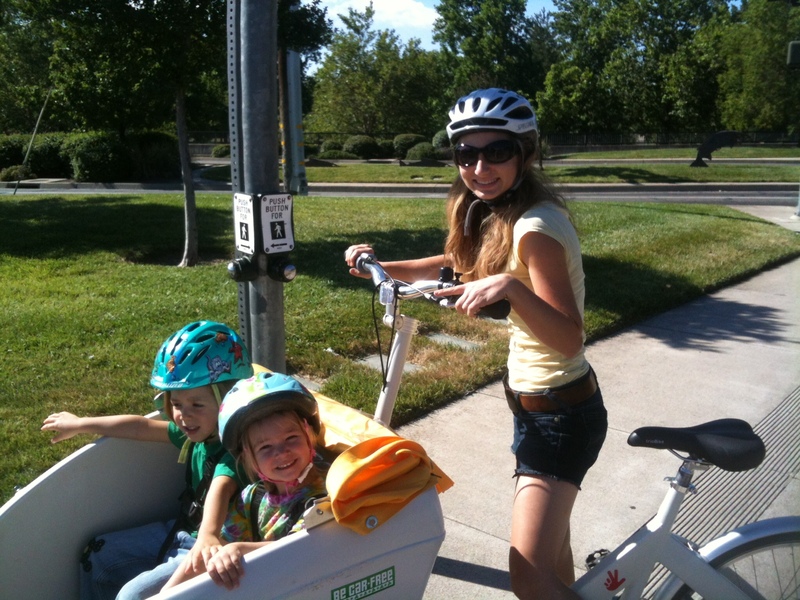 Learn more about Bikestations across the country. 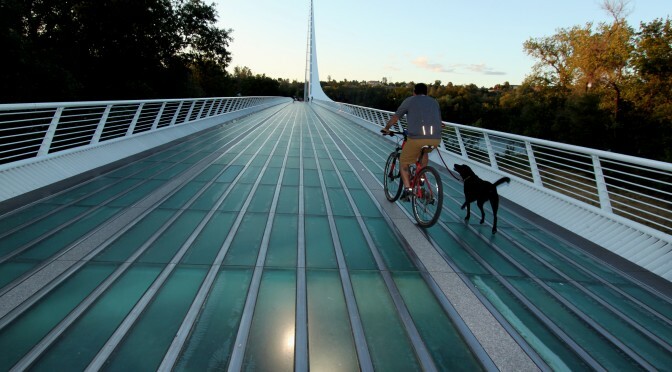 This report gives examples across the country of public places and trails near railways. 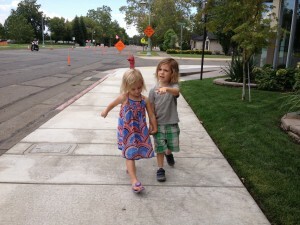 The Downtown Redding Railyard project needs ideas and support from all of us across the community. 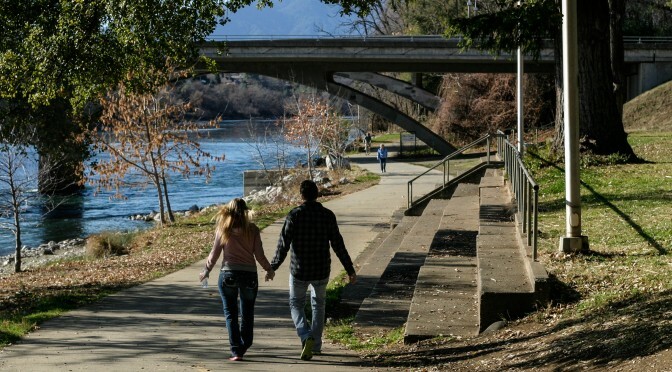 There is much we can do to build a livable community and a vibrant downtown in Redding. The photo below is from a project in Rockville, MD. 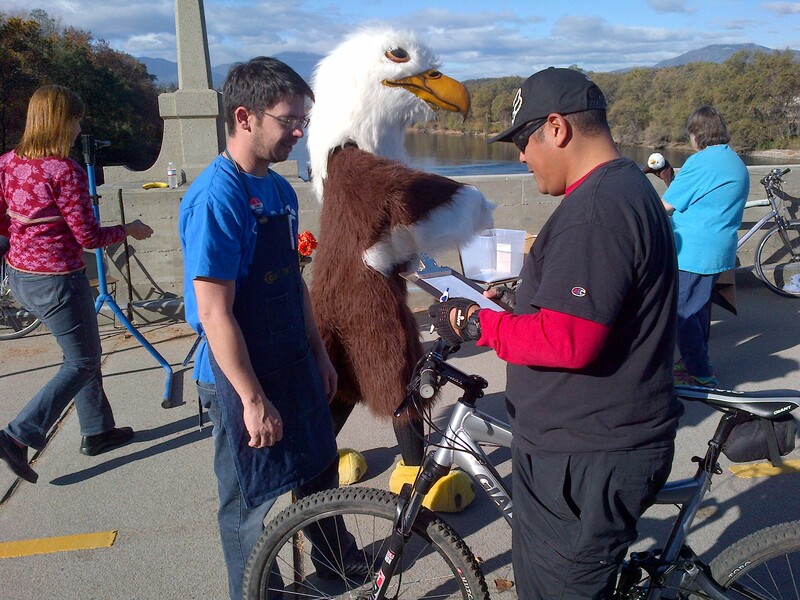 Are you looking for a copy of the recent article about Redding trails? We met a number of people at today’s event on the Diestelhorst Bridge who had not had a chance to read this article. Feel free to share with anyone you think would be interested. There are two versions of the article, a shorter version for the print magazine, a longer version online. Both are available at the top of our Media page. 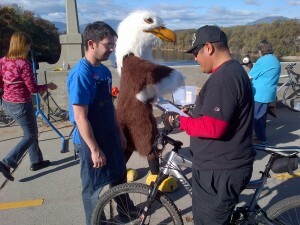 Yep, that’s an eagle enjoying the trail with us. The term road diet can be misleading, conjuring images of sacrifice, frustration, and scarcity. We prefer the term “rightsizing.” The goal is to reallocate resources in a more useful way that reflects the current needs of the community and to make streets more livable for everyone. Rightsizing is typically applied to streets with excess capacity, most commonly two-way streets with two lanes in each direction. Rightsizing usually reconfigures the street to one lane in either direction, and the freed-up space is then used to improve the street’s facilities. In Parkview Avenue’s case, a well-marked bike lane has been added in either direction along with a center turn lane. Parkview Avenue has actually gained a lane—going from four lanes to five—one in each direction for motorists, one in each direction for cyclists, and a center turn lane for safer turns! The city has also added bulb-outs at several intersections. Bulb-outs are features where the sidewalk is extended into the street at corners, making a bulblike shape. 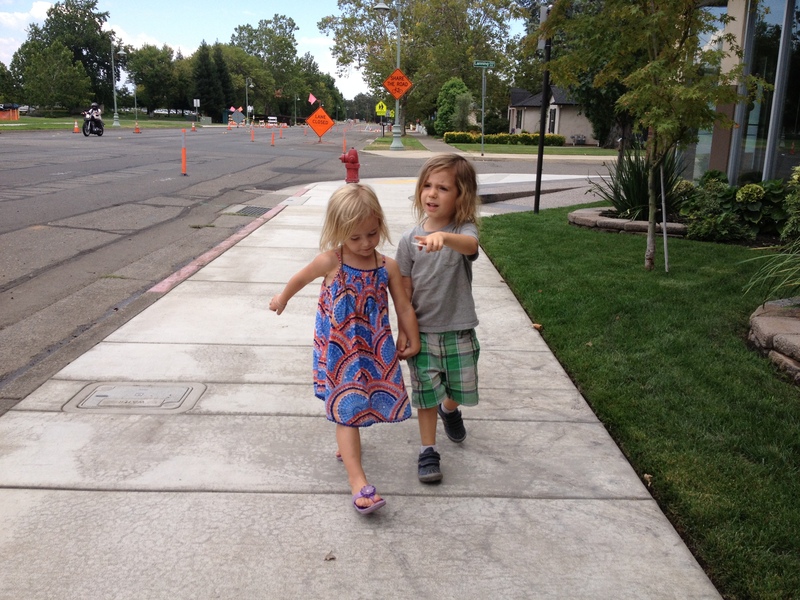 Bulb-outs make streets much more pedestrian friendly because they shorten the distance to cross from sidewalk to sidewalk—which is great for families with small children, the elderly, and the differently abled. Bulb-outs also encourage cars to slow down in order to safely navigate the turn onto the cross street. Decreases vehicle travel lanes for pedestrians to cross, therefore reducing the multiple‐threat crash (when one vehicle stops for a pedestrian in a travel lane on a multi‐lane road, but the motorist in the next lane does not, resulting in a crash) for pedestrians. Improves safety for bicyclists when bike lanes are added (such lanes also create a buffer space between pedestrians and vehicles). Provides the opportunity for on-street parking (also a buffer between pedestrians and vehicles). Reduces rear-end and side-swipe crashes. Improves speed limit compliance and decreases crash severity when crashes do occur. When modified from four travel lanes to two travel lanes with a two-way left-turn lane, roadways have experienced a 29 percent reduction in all roadway crashes. Numerous rigorous studies show that rightsizing significantly decreases the number of accidents on a street and does not affect the volume of traffic a street can handle. Rightsized streets have been successfully implemented in numerous cities such as Seattle, San Francisco, and Palo Alto. 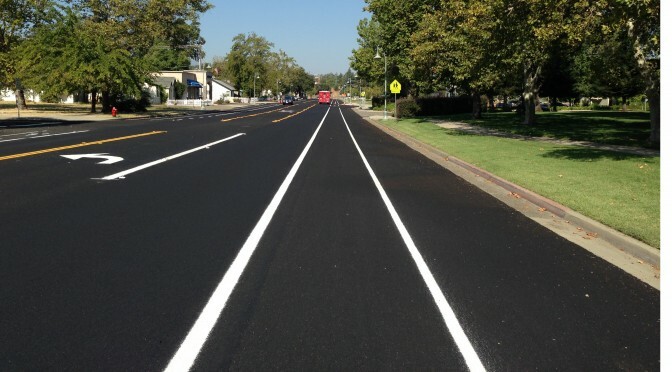 Rightsizing is endorsed by the Federal Highway Administration as a proven safety countermeasure that benefits motorists, pedestrians, and cyclists. Furthermore, The 2000-2020 City of Redding General Plan designated Parkview as a focus area and called for the city to “establish public open-space and pedestrian/bicycle links between the river and parks, activity centers, schools, and other major open-space areas such as stream corridors” and to “provide for a pattern of development that encourages walking, bicycling, and transit use.” Parkview Avenue was also named as proposed Class II bikeway facility in the transportation element of the general plan. There are still some areas for improvement and issues brought up by local residents that have not yet been addressed. For example, there is a section of sidewalk that was not completed and crucial improvements are still needed to help people walk and bicycle safely cross the A.C.I.D. canal. We encourage the city to address these as soon as is possible so that Parkview Avenue can truly be considered a complete street. That said, the improvements that have been made terrific. It’s great to see the City of Redding focus on Redding’s core and impressive to see how far Parkview Avenue has come in the past decade!